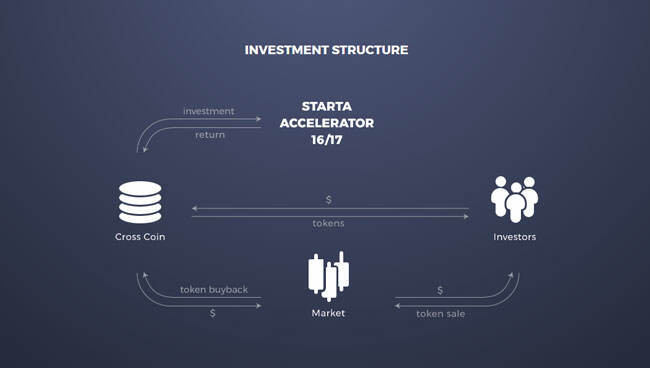 Starta Accelerator is a well-established corporation, currently partnered with Cross Coin in a joint venture ICO crowdfunding. The business model it employs is very straightforward, which is something we don’t see that often when it comes to ICOs and hi-tech startups. Read about the entire process and the ICO itself in our detailed Starta review and see what our team of experts had to say about the presented business plan. Starta Accelerator is administered by a professional and experienced team of four general partners and co-founders, including Alexey Girin, who has over 15 years of experience with early stage technology investment in both Russia and the US, Ekaterina Dorozhkina, with more than 10 years of experience as a marketing executive for Wall Street companies, Ludmila Golubkova, who has over 25 years of experience in top managerial positions in telco and IT, plus more than 15 years in venture capital, and Sergey Vasiliev, who has more than 15 years of experience in IT and telco, with roughly 10 years of experience in venture capital. Ekaterina Dorozhkina is the head of the US branch of Starta Accelerator and handles its activity there. She’s also in charge of working firsthand with portfolio companies during the program. Ludmila and Sergey are stationed in Moscow and they’re in charge of market monitoring and managerial activities regarding the accelerator pipeline in Eastern Europe. Starta Accelerator also features numerous partners and associates across the two continents. Starta Accelerator 16/17 LLC is an SPV created for investing in early stage East European tech companies through acceleration in the US. It was launched in 2015 by Starta Capital VC Fund, a unique program aimed at helping East European countries gain traction in the US and achieve seed/Round A funding. The main requirements for portfolio enlistment are traction in Europe/CIS countries, MVP, and globally adaptable business model. To put it more plainly, Starta Accelerator recruits established East European companies and enables them to make an initial breakthrough toward the American market. In order to fund such endeavors, they utilize crowdfunding programs, giving ample benefits to potential investors. 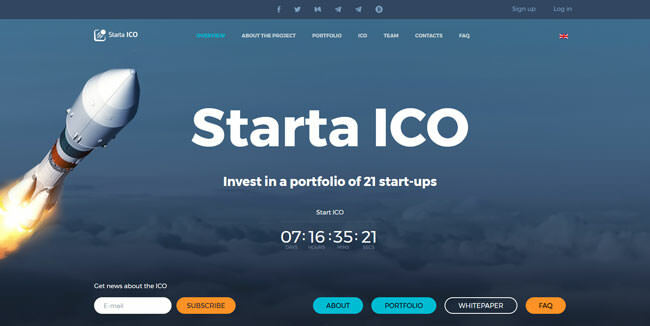 In this particular case, Starta engaged a joint ICO crowdfunding campaign with Cross Coin. The main principle remains the same, refinancing a pool of tech startups, with the end goal of performing a venture “exit” in favor of a strategic investor for the highest profit margin possible. The project will function as a normal crowdfunding venture, with an active secondary token market, increasing the instrument’s liquidity. Cross Coin will issue Starta Tokens through the Waves blockchain platform, which should offer optimal transparency and convenience for all the participants involved. Starta is built around a simple idea, but simplicity and a minimalist approach can work wonders in the world of venture capitalization, as it turns out. Namely, they perform an acquisition of a certain number of East European established applicants and “shapeshift” them in a way to resemble standard American tech companies, which would cost much more to acquire in the first place. The average acquisition cost is around 2 million dollars and the projected exit valuations stand at around 10-50 million dollars. This is basically Starta’s business model in a nutshell, which ensures a proper reimbursement for the investors. Thus, the tried & true business approach is the number one reason to invest in this project, followed closely by the planned 10x return margin per company. Starta Capital VC Fund has been operating since 2011. Their track record can be inspected and you can determine whether they’re a good fit for you based on concrete evidence. That’s not something a lot of companies out there offer. Also, if you own a startup company and have difficulties with penetrating the American market, Starta is a perfect choice to help you achieve that necessary growth and follow you closely all the way to the finish line. Cross Coin has set the first ceiling for investments in the Starta Accelerator portfolio at 5 million dollars. 1.5 million will be utilized to purchase 33% of Starta Accelerator 16/17 SPV at the current portfolio valuation price. Collected funds above that amount will be geared toward the future portfolio of Starta Accelerator, keeping the identical investment focus. If ICO results in funds bellow the projected amount, the acquired share of the portfolio will reduce accordingly. The price of Starta tokens will be set at 1 dollar and the token amount will, by the nature of things, be equal to the funds collected. Cross Coin will then utilize the net profit and the remaining assets to buy back the tokens at the current market price. Note that 5% of the tokens will be reserved for the ICO administration costs. Total fees will amount to 2.5%$ of the net profit. Starta tokens will be distributed only until the conclusion of the ICO period and they will be traded in the stock market dedicated to crypto assets. The token buyback period will be fixed and it shouldn’t last for more than a month after the total net profit is gained. Alternatively, you can also sell your Starta tokens on a secondary market, on any of the currently operating cryptocurrency exchanges. They are bound to grow in price but note that Cross Coin has a legal obligation to spend the net profit on the token buyback. The tokens will be purchased via the TIDEX exchange. You can also sell you tokens before the exit is executed, but that’s only recommended if you’re somewhat stranded for income and can’t spare extra time for their price to reach full growth. The ICO is set to start on 4th of July. Once the ICO starts, you’ll be able to make a financial contribution through their website, following the 1 Starta token = 1$ ratio. Apart from that, you can also apply for other jobs outsourced by Starta, comprising social media campaigns, translation and moderation tasks, and Bitcoin signature and avatar campaigns. Starta and Cross Coin’s joint ICO is definitely an interesting opportunity for a wide range of investors. The main appeal of this venture model is the high market volatility, so even with relatively small funds invested, you can still gain access to a diversified portfolio of crypto assets and the opportunity to diversify your assets by investing in the fiduciary economy sectors. Long story short, Starta ICO left a very positive impression on us, especially by pioneering a joint ICO crowdfunding approach. Apart from that, we also approve every technical aspect of the model, save for the overly expensive tokens issued by Cross Coin.